There’s nothing quite like signing your first student off for a solo flight. If you’re anything like I was, both you and the student are nervous. The student’s nervous about the flight. You’re not worried about the student – he’s ready to go. It’s the myriad of endorsements that have you concerned. You’re a pilot and CFI, not a lawyer. The process is confusing for anyone – from a chief instructor down to a first-time CFI. Everything you need to know is described in FAR Part 61, as well as AC 61-65E (Change 1). They can be complex, so I’ll break it down and – hopefully – simplify it a bit. In this post, we’ll talk about the first item, basic solo endorsements. We’ll cover the other items in the coming weeks. 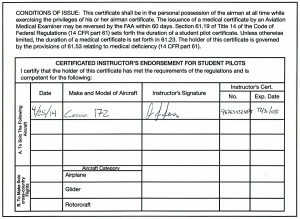 One of the most confusing parts of endorsements is figuring out where to put them – sometimes you find them on the student pilot certificate, and other times they’re in the logbook. And sometimes, they’re on both. Awesome. First, you’ll need to provide training on the knowledge items in 61.87 (b). Then, you’ll give the student a pre-solo written test and review all incorrect answers with the student. Is the pre-solo written exam endorsement required? No. You can log the pre-solo written exam as ground training in the logbook, but you should clearly record that you gave the test and reviewed all of the incorrect answers with your student. You can also add the endorsement to the logbook – it’s up to you. You’ll also need to provide (and log) flight training on each of the maneuvers and procedures listed in FAR 61.87 in the same, or similar, make and model as the solo aircraft. You’ll make sure that the student demonstrates satisfactory proficiency and safety in each of the maneuvers. This endorsement expires after 90 days, but you or another instructor can keep it current by adding this next endorsement. 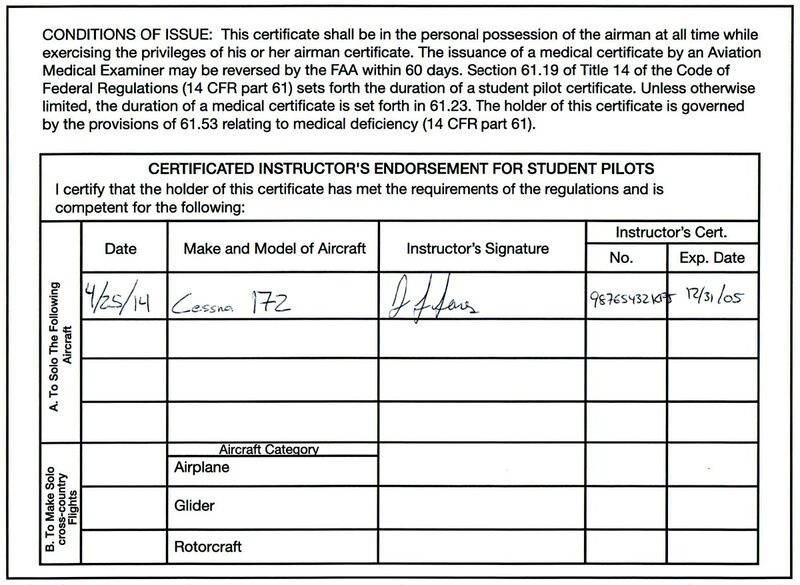 While the student’s endorsement on their pilot certificate never expires, the original logbook make and model endorsement expires after 90 days. To solo anytime after that date, you’ll need to update the student’s logbook with another make and model endorsement. Think of this as a student pilot version of 90-day currency. Before you give this endorsement, you’ll need to give the student training on the maneuvers and procedures identified in FAR 61.87, and determine that they’re proficient in both the maneuvers and procedures and in the make and model. If you’ve taken over the student from another instructor, make sure you’ve evaluated each these maneuvers and procedures at some point and time. I certify that (First name, MI, Last name) has received the required training to qualify for solo flying. I have determined he/she meets the applicable requirements of FAR 61.87(p) and is proficient to make solo flights in (make and model). The FAA addresses limitations indirectly in the cross-country endorsements section of AC 61-65E, but they don’t cover them in the FARs. So, should you add limitations to the student’s logbook endorsement? I think it’s a good idea. First, it may help limit some of your liability as an instructor – you probably don’t want your student taking the airplane up solo in 30kt gusting crosswinds. Remember, after your student’s endorsed, they don’t need to ask your permission to fly. These endorsements are the first solo endorsements your student will receive – and they’re needed for every solo flight, even cross-countries.